The Panasonic Arc5 and Braun Series 9 electric shaver models are among high-end choices you can find for your shaving requirements. You can use either choice to you trim more hair in less time. The technical qualities in each shaver also provide you with more control over your shaving experience. The two models look similar in appearance, but they are also very different from one another. 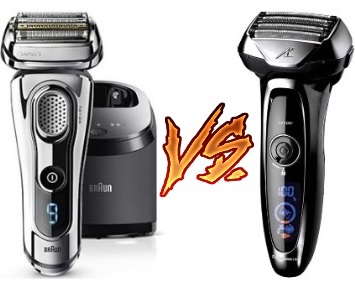 This Panasonic Arc5 vs Braun Series 9 analysis will delve deep into these two model lines to see which one is best for your shaving demands. You may be interested to see how these two models are unique from one another. The Arc5 series is named for how it offers a five-blade approach to shaving. The blades are housed within the foil covers. The ARC materials are forged out of Japanese stainless steel. Every blade is carefully honed at a 30-degree angle to produce a sharp body that adds a sense of comfort. Each blade is also independent from one another and is positioned a few millimeters apart for a consistent multi-part cut. Three foil rolls are included on the Arc5 shavers. Each foil has a distinct pattern. A reverse-tapered foil will lift and cut hair. A separate blade also catches long hair so the other foils can trim it down. Skincare rollers are included around the front and end parts to reduce the friction produced by the shaver. The last foil will identify hairs that have not been cut down all the way. The 3D Multi-Flex system provides a multi-part approach to positioning the shaving head. The body moves along the contours on your face, including the curves along the neck and jaw. The shaver moves along the skin without irritation or pulling. You will feel a relaxing sensation with each trim. The layout is important for helping you to take advantage of the many parts on the foil cover. The Beard Sensor feature on the Arc5 series of shavers identifies how thick your hair is. The sensor will review the density of your hair and then adjust the power setting on the motor. The motor will operate at a high setting when you have thick hair. The power is toned down as you work with bare or light spots. You will not drain the battery all that quickly. A rubberized grip works on an Arc5 shaver. The rubber includes a few groove lines to produce a firm hold that will not slip out of your hand even when in the shower. The design works in either hand. The rubber is soft on your fingers and palm. The layout also lets you position your hand to where you will not cover up the battery or power indicator screen on the bottom part of your shaving tool. The Series 9 line from Braun provides several pivoting points. The individual foils and the main shaving head both flex back and forth to cover every surface on your skin. In all, the shaving head and foils use ten dimensions of motion to provide more contact for a better all-around shave. The shaver bends to cover every space on your face. The OptiFoils on the top part of the Series 9 shaver gives you more control over how your hair is collected. The foils use a honeycomb-like design that collects more bits of hair with each pass. The skin guard and middle comb features will collect any hair that has not been cut by the first foil and will raise it up so the second one can cut it off. Also, the density along the middle part of each foil is slightly thicker than what you would find on the end. The LED display on the bottom part of the Braun shaver shows multiple details. 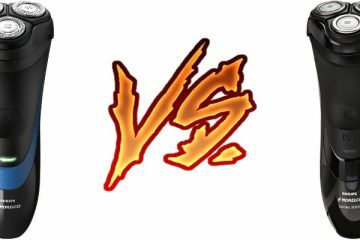 You will see how much power is left on your charger. The body also lists details on how well the shaver head is performing based on efficiency. You may also be reminded to clean off the shaver after use. You can wash it off under a faucet or in the Clean and Charge station that your model may come with. The MultiHeadLock system keeps the Series 9 shaver in its place. The lock is activated through the button on the top part. Your thumb may rest on the button while you shave. Press the button to lock the shaver head position in its place. The shaver will not pivot or shift as you keep the space locked. You can use this feature to target difficult to reach hair spots like around the nose or on the sideburns. The Clean and Charge station that your Series 9 shaver will come with features several points that go well beyond just charging up your shaver. The Clean and Charge station will clean and lubricate your shaver. Press the button on the base to trigger the washing function. A cleaning material or water may work inside the station. The unit also charges your shaver and also reminds you when you should use it for shaving. 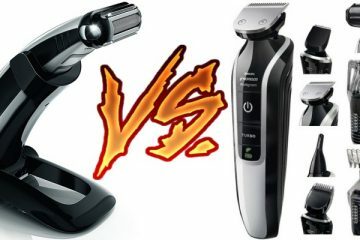 This first Panasonic vs Braun comparison involves two of the company’s most powerful shaver models. Both of these offer a firm body for shaving, but there are some differences between the two. 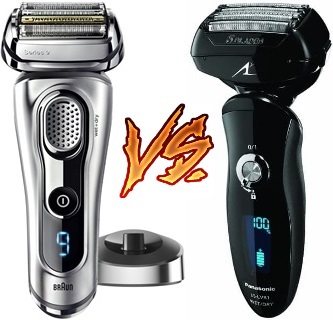 Braun and Panasonic both use different standards for their shavers. Braun’s design is German-inspired, while Panasonic layout comes from Japan. The difference is prominent through how the blades have unique designs. Whereas the Braun Series 9 9290cc uses titanium-coated steel materials, the Panasonic Arc5 ES-LV95-S uses Japanese stainless steel. The two models use different motors. The Braun trimmer comes with a basic rotary motor that produces microvibrations for reducing friction and pull. The dense cross-cutting body produces a clean cut every time you use it. Panasonic’s trimmer uses a linear motor that generates force along the length. No torque or rotation is produced. The feature creates a cleaner cut every time you use it. The process you use for locking the pivoting head varies by model. The Braun trimmer uses a button at the top to trigger a lock. Panasonic uses a latch on the back end that lets you switch between a free-moving head and a locked head. You can also use the small ring around the power button and adjust its position to a locked setting if you prefer. That same latch on the Panasonic shaver helps for lifting up its precision trimmer. Braun also has a trimmer on its razor, although that requires you to use a dedicated control. The digital displays on the bottom part reveal specific features. The Panasonic model is a little more detailed as it offers more points for identifying how this works. A battery power gauge is included one display. Another ring on the display shows how much power the motor is generating. Separate indicators for wet use and charging are on the bottom. The Braun display uses a single-digit design. The layout tells you about how many minutes of battery power you have left as the power source runs out. A small meter that lists how well you are shaving is also included. The readout is based on how quickly you shaved and how much battery power was used. The program guides you in figuring out what you can do to improve upon your shaving performance in the future. Braun’s battery lasts for about ten minutes longer than what Panasonic uses. Both models can still be charged up in an hour. Each unit also comes with a quick charge feature to give you power for a single shave in five minutes. That feature would work better if you were in a hurry for any reason. The second part of this Braun Series 9 vs Panasonic Arc5 review entails two second-tier models in this line. These both include significantly helpful features for your cutting needs. The pivoting points on both of these trimmers provide you with a comfortable cut all around. The two use pivoting heads that tilt back and forth along your face. The two trimmers move along the same position, but these should both work with straight strokes to capture more hair without much effort. Both models come with timers, although their functions are different. The single-digit display on the Braun shaver shows how many minutes are left on your battery’s charge. The Panasonic shaver uses a timer that lists how long you are spending shaving. You can use the timer to keep tabs on how efficient you are when shaving. Braun’s shaver produces microvibrations to create a relaxed shaving experience. Braun uses its sonic technology system to create gentle vibrations over your face to relax the skin and to move over hair in little time. The motor produces about 10,000 microvibrations every minute. Panasonic uses a different approach in its Arc5 shaver. A linear motor produces 14,000 cycles per minute to promote a crisp clean without adding friction. The lack of friction means no added vibrations have to be felt. The fast blade motions also ensure a smooth trim every time you use the shaver. 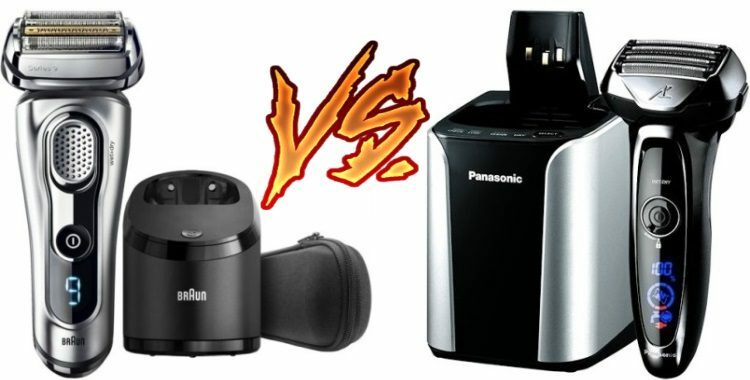 The motor Panasonic uses is also relatively silent when compared with what Braun offers. The Arc5 shaver does not produce lots of friction. 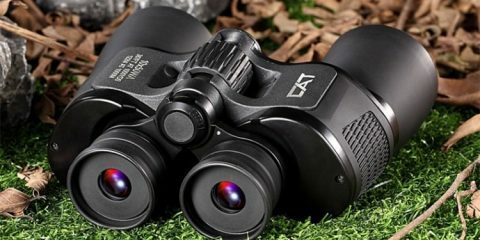 The adapting foil heads on both models give you a comfortable surface that fits on your face with ease. Braun’s foil heads are more advanced. 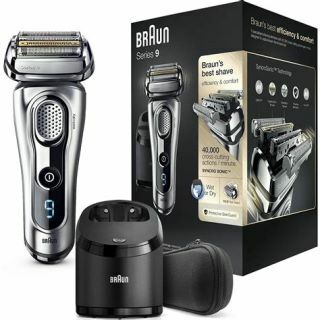 Braun uses the SyncroSonic system to read your beard and face contours to adjust the trimmer’s power setup. The setup reviews your face 160 times per second, thus giving you a more accurate cut every time you use it. Braun uses a basic charging stand. The stand is small in size and keeps the shaver upright. 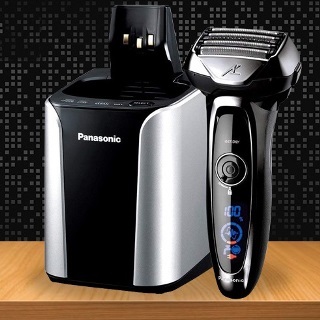 The Panasonic uses the Premium Cleaning and Charging System to power up the battery and clean off its shaving area. The charging station uses a few buttons to trigger a cleaning or drying process. Braun does have a similar charging system for the 9293s, although you would have to buy that part separately to make the layout work for you. Braun and Panasonic have unique models that deserve your attention. This Panasonic Arc5 vs Braun Series 9 analysis should have answered your questions on what makes each of these models different. Each of these models is useful in various ways. 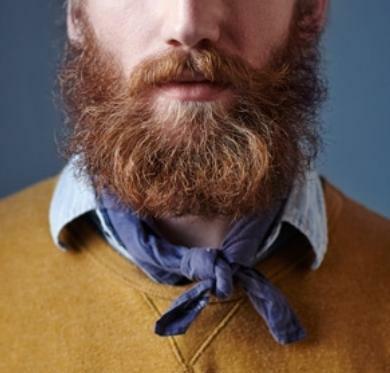 You should think about your shaving demands whie looking at what you are the most comfortable with. Good luck in finding a choice that fits for you. Remember that the Panasonic Arc5 and Braun Series 9 lines are both high-end choices that give you extra control over your shaving routine no matter how you proceed with the task.